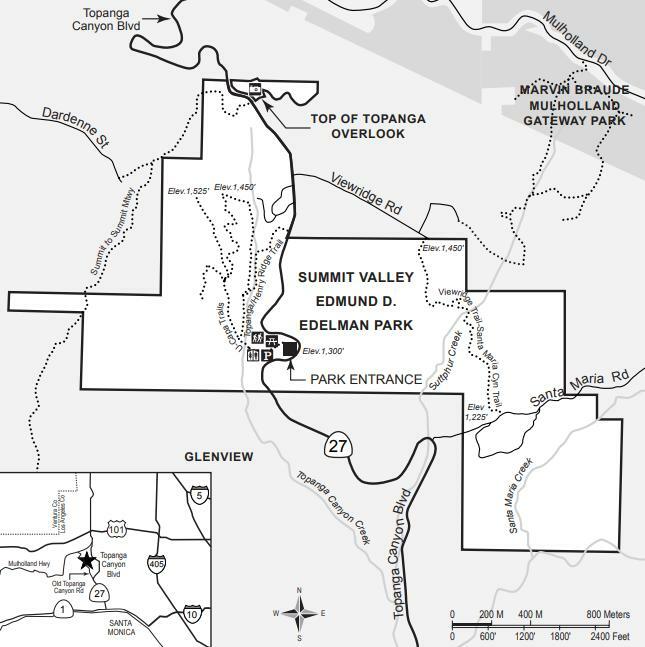 Accessed from Topanga Canyon Boulevard south of Viewridge Drive, 652-acre Edmund D. Edelman Park provides hikers, mountain bikers, and equestrians access to a network of trails into the gently rolling hills of the Summit Valley and upper Topanga Canyon. The trailhead is equipped with parking, restrooms and picnic benches. The stately oak woodlands, native grasslands, and mixed chaparral communities of upper Topanga Canyon provide excellent wildlife habitat and serve as a key link in the east-west wildlife corridor. The park encompasses the headwaters of Topanga Creek as well as the steep cliffs of Santa Maria Canyon.